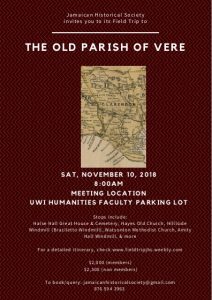 There will be a field trip to the Old Parish of Vere on Saturday, November 10th 2018. The itinerary will include Halse Hall, Bog Estate, the octagonal windmill at Hillside, Moorlands, Lionel Town, Monymusk Estate and distillery and St. Peter’s Church in Alley. 8.00 a.m. – University of the West Indies, Humanities Parking Lot on the Ring Road across from Mary Seacole Hall. 5.30 p.m. – Estimated time of return to U.W.I.